The artistry of fashion designer Cesar Gaupo was as limitless as his mind. One would know just by observing his sophisticated designs of ready-to-wear clothes, gowns, and footwear. 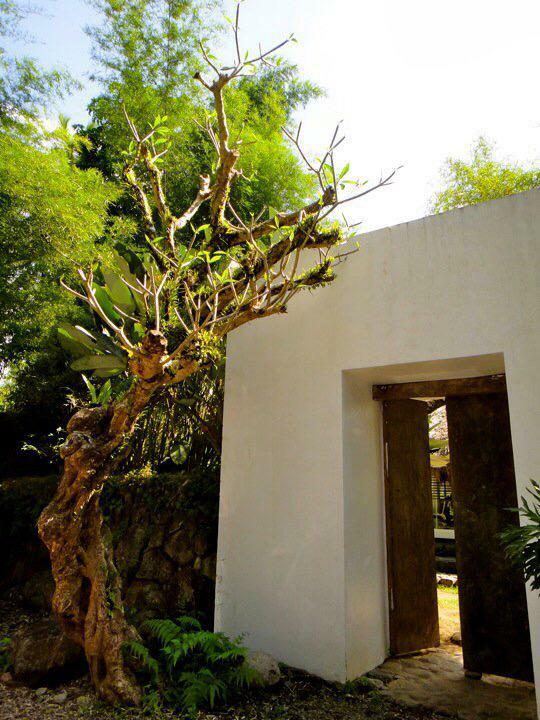 His creative skill had even transcended to other fields of design, as witnessed by his friends and colleagues who have visited the forest-tucked house sketched, designed, and built by Gaupo in Majayjay, Laguna. The front gate Reyes was referring to was a tall white-washed concrete wall that surprisingly blends naturally with the area’s green foliage. In the middle of the wall are antique wooden doors. Push these open and, as Reyes recalls, you will be greeted by an open layout, a vast lawn that separates two structures: the living room and receiving area at the left and the dining area at the right. Both designed like a nipa hut. 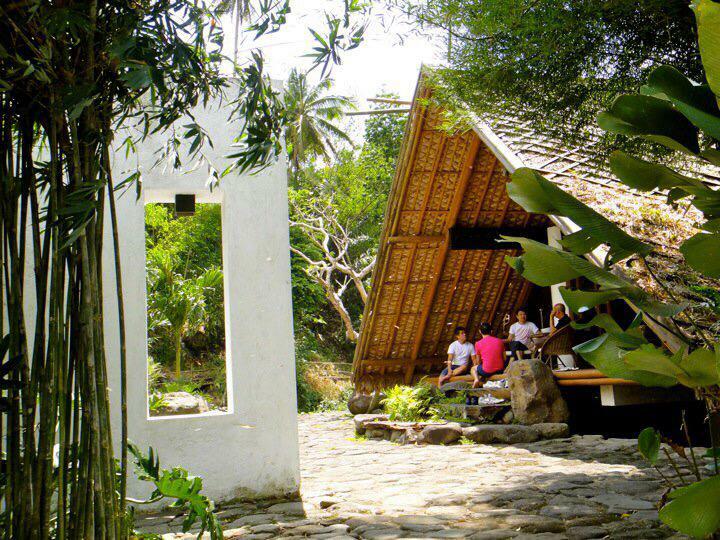 “Both structures feature very high and very imposing thatched roofs,” says Reyes. 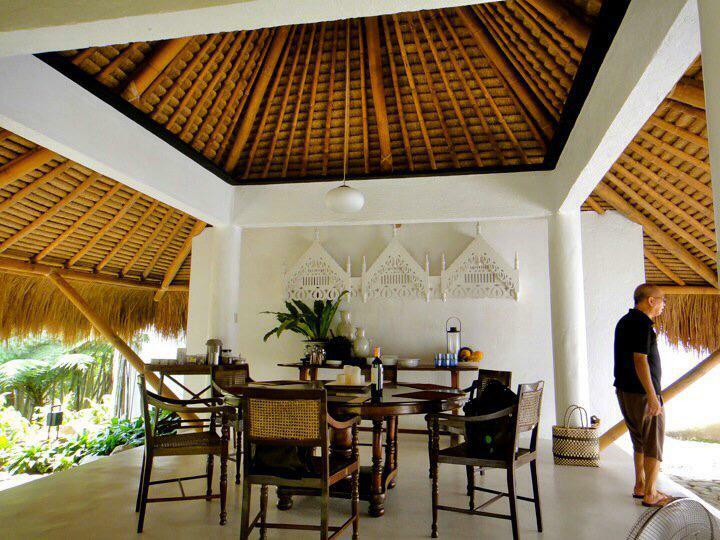 The high ceiling, where an intricate layer of cogon serves as roofing, provides ventilation, making the use of air condition or electric fans unneccessary. A grassy courtyard and large stone steps lead to the living room. Once you’re inside, you’ll notice two sets of big wooden doors on opposite sides, giving way for the forest’s airiness and relaxing ambience to pervade the structure. A juxtaposition of concrete and wooden furniture fill the room’s marble flooring, accented by Gaupo’s trinkets, bold-colored pillows, lamps, and reading materials. One wouldn’t notice much difference once the doors are closed, however, since no concrete walls separate the inside from the outside. Only glass corners paired with wooden blinds keep the living room enclosed. 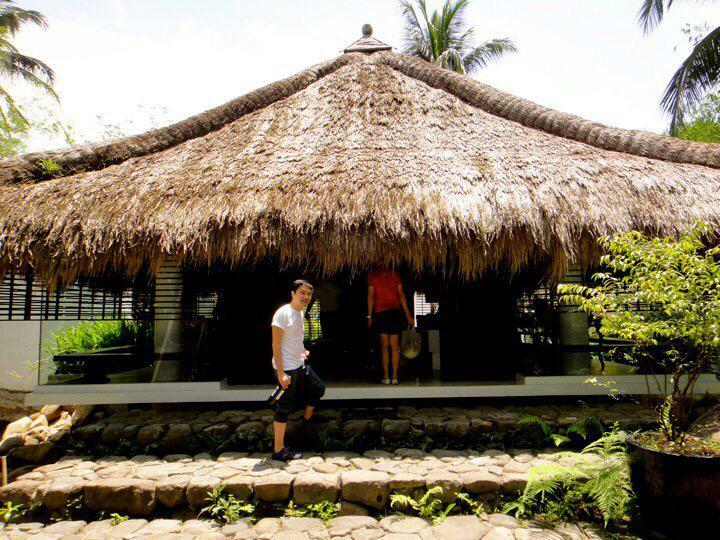 The same set of thatched cogon roofing tops the pavilion enclosing the six-seater dining area. Unlike the living room, this structure carries a more simple layout. Raj-styled wooden chairs and a round antique table are in the middle while a wooden buffet table and tea trolley stand quietly at the back. 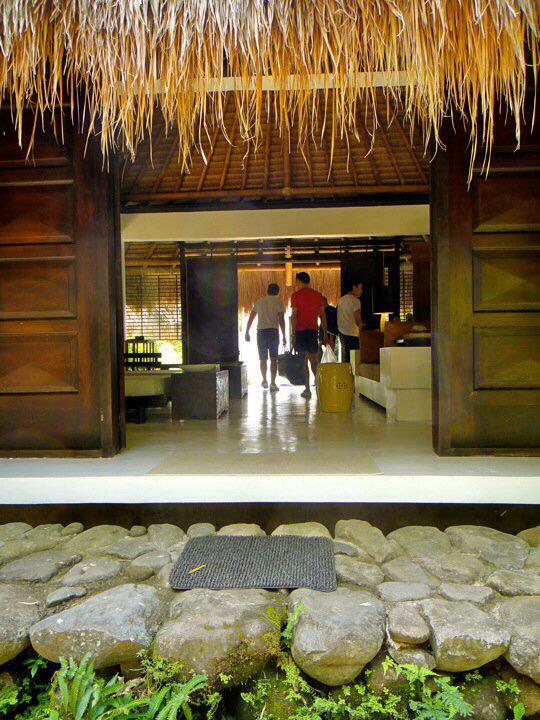 In between the two structures is another gate, as if Gaupo’s unconventionally built nipa hut-styled receiving rooms aren’t enough to leave guests in awe. The doorway leads to stone steps wet by the running river it is located on. 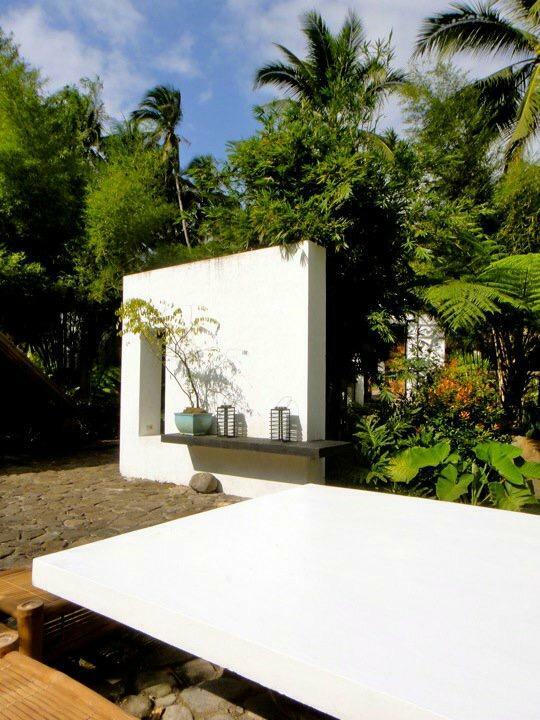 These steps, designed and built by Igorot workers, lead to another white-washed concrete wall that apparently separates Gaupo’s master bedroom from the whole property. 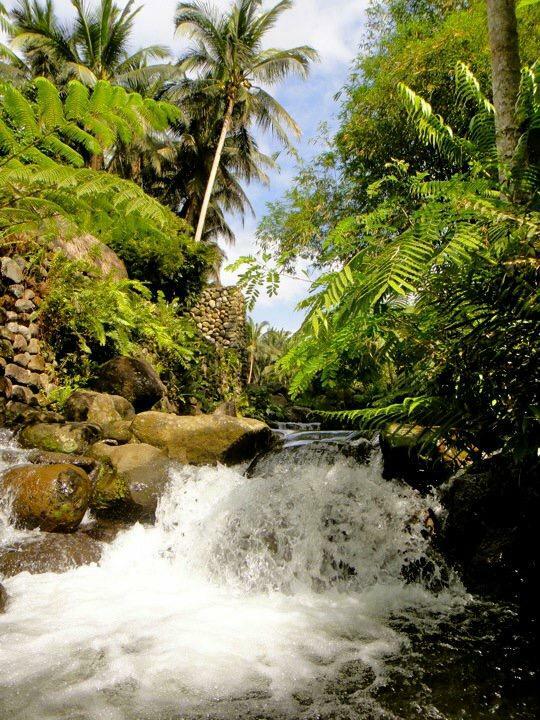 This means before you reach the bedroom, you have to climb the stone steps wet by the cascading river surrounded by green foliage. “You will definitely get your feet wet when you cross the brook,” says Reyes. From floor to ceiling, Gaupo’s master bedroom is dominated by bamboo. At the middle is a four-poster bed that Gaupo also designed. Behind the headboard is a tall white wall and hiding behind it are the toilet and bath. But the one detail that still fascinates Reyes up to this day is the one hidden under Gaupo’s bedroom floor. Reyes only visited Gaupo’s home once, but its impression on him lasted for years. “It’s a well-designed juxtaposition of rigidness and nature,” Reyes tells Nolisoli.ph. And come to think of it, the whole compound is actually a mix of those contrasting things—from the living and dining room’s marble flooring and thatched cogon roofing to the doorways’ imposing entrances built on stone steps by the river. It’s a mixture of all things modern and antique, carefully sewn together by the artistry of Gaupo. His passing last Saturday was truly a sad moment for the Philippine design world. But like what his friends and peers said, Gaupo will always be greatly remembered not just for his works, his mentorship, his house, but also for his happy and humble self. (Read: Friends and peers recall the happy and humble “bagets” that was Cesar Gaupo).